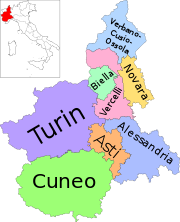 Vercelli (Italian: Provincia di Vercelli) is a province in the Piedmont region of northern Italy. Its capital is Vercelli. As of 2015[update], it has an area of 2,081 square kilometres (803 sq mi) and a total population of some 176,000. It is an area known for the cultivation of rice. Sacro Monte di Varallo. Façade of the basilica. In 2003, UNESCO added the Sacred Mountain of Varallo to the World Heritage List. Other historical sights include the Basilica of Sant'Andrea in Vercelli. There are also numerous natural sights in the Valsesia area. This page was last edited on 13 March 2018, at 06:14 (UTC).